Geoffrey Chaucer and St Valentine’s Day. Whan euery bryd comyth there to chese his make. The above illumination is from one of the 86 manuscripts of The Canterbury Tales, the Ellesmere manuscript. Included among these 86 manuscripts is William Caxton’s printing of the Tales, one of the earliest printed books: 1478. Very early printed works, published between 1450 to 1501, are called incunables. Johannes Gutenberg (1398 – February 3, 1468) is considered the first printer (c. 1439). Early printers, printers of incunables, sometimes left blank spaces where enluminures or illuminations were inserted. Historiated first letters are quite common in incunables. Lupercalia was eventually replaced by Saint Valentine’s Day, celebrated on the 14th of February. The 14th of February is no longer a feast day in the Catholic Church. But it is a feast day in the Anglican Church. Moreover, Ireland and France have relics of St Valentine, Valentine of Terni in Dublin and an anonymous St Valentine in France. Valentine who restored his jail keeper’s daughter’s sight and slipped her a note that read “From your Valentine,” the night before his martyrdom. Valentine of Rome, is mentioned, albeit inconspicuously, in Jacobus de Voragine’s The Golden Legend. Moreover, the Roman Martyrology, “the Catholic Church‘s official list of recognized saints,” gives only one Saint Valentine, the martyr who was executed and buried on the Via Flaminia and whose feast day is February 14th. (Saint Valentine, Wikipedia.) This saint’s only link with St Valentine’s day is the note he slipped to his jailer’s daughter. This note would be the origin of Valentine’s Day cards. However, as I mentioned above, if this saint is associated with Valentine’s Day, the note signed “From your Valentine” is the only link between a saint named Valentine and Valentine’s Day. The note constitutes the required romantic element. As mentioned above, Saint Valentine’s Day was not the feast of lovers (i.e. 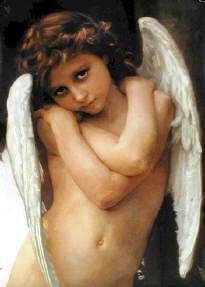 people in love) until a myth was born according to which birds mated on February the 14th. This myth is probably quite ancient but it finds its relatively recent roots is Geoffrey Chaucer‘s (14th century) Parliament of Foules. Othon III de Grandson (1340 and 1350 – 7 August 1397) [in French], a poet and captain at the court of England, spread the legend to the Latin world in the 14th century. This legend is associated with the famous mille-fleurs (thousand flowers) tapestry called La Dame à la Licorne (The Lady and the Unicorn), housed in the Cluny Museum in Paris. N.B. 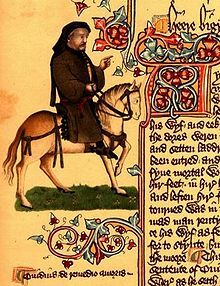 The first version of the Canterbury Tales to be published in print was William Caxton’s 1478 edition. Caxton translated and printed The Golden Legend in 1483. Knowledge of these texts was disseminated in courtly circles, the French court in particular, at the beginning of the 15th century, by Charles d’Orléans. At some point, Othon’s Laments were forgotten, but St Valentine’s Day was revived in the 19th century. It is about a legend, found in Chaucer‘s Parliament of Foules, according to which birds mate on the 14th of February. It is associated with an allegorical tapestry: La Dame à la licorne. It is about Othon III de Grandson (FR, Wikipedia), a poet and a captain who devoted thirty percent of his poetry to the traditions surrounding St Valentine’s Day. It is also about courtly love and, specifically, Le Roman de la Rose, part of which was translated into English by Geoffrey Chaucer. Finally, it is about Charles d’Orléans who circulated the lore about St Valentine in courtly circles in France. There is considerable information in Wikipedia’s entry of St Valentine’s Day. It was or has become a trans-cultural tradition. [i] “Valentine’s Day.” Encyclopædia Britannica. Encyclopædia Britannica Online. Encyclopædia Britannica Inc., 2012. Web. 13 Feb. 2012. <http://www.britannica.com/EBchecked/topic/858512/Valentines-Day>. [ii] “Saint Valentine.” Encyclopædia Britannica. Encyclopædia Britannica Online. [iii] “Claudius II Gothicus.” Encyclopædia Britannica. Encyclopædia Britannica Online. [iv] “Saint Valentine.” Encyclopædia Britannica. Encyclopædia Britannica Online.